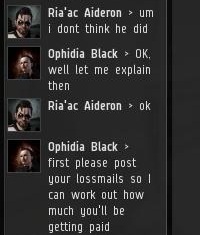 Ophidia Black is such a great person. I have a clutch of her hair which smells divine! 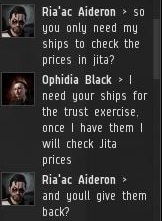 I noticed her walking around the Jita station a while ago, browsing the various wares when an opportunity presented itself. Whilst she was preoccupied looking at the prices of Catalysts I strode past her, quickly removed a minuscule amount of hair and retreated to my ship. Ah yes, the scent of the truly righteous and just knights of the New Order is a glorious scent indeed! I went through the trusting test in Runescape when I was around eleven. Guy took my Mithril Mace. I was super pissed - I think I teared up. Just a little. 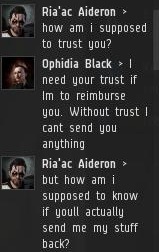 I see now, of course, that it was my fault for not trusting him with my other stuff, too. I had failed the test. Something superficial was taken from me, but something far greater was given. I think I learned that day something special. 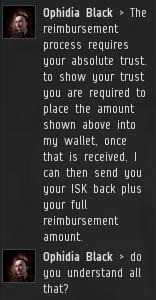 That when another player, another person, tells me earnestly with nothing but honesty in their heart that I need to trust them, I must trust them with all my mind and body and soul and wallet. I didn't deserve that Mithril Mace. Tune into the next episode and be amazed! I read on a spoiler website, one which I'm legally not allowed to disclose and know what happens in the next episode and even the next season! You MAY (I say may so I don't break my non-disclosure agreement) be surprised with how this story concludes! 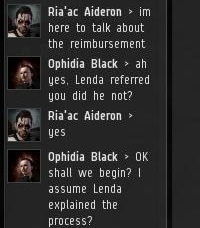 I can say with 100% certainty that Ophidia Black conducts herself with the utmost decorum and honesty during this entire episode. I've seen the logs, and no one could possibly find fault in her behavior. Also, I'll pay 100 quatloos for a lock of her hair. 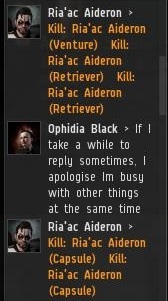 Ophidia Black is one of those agents other agents strive to emulate, always going the extra mile and putting in 110%. 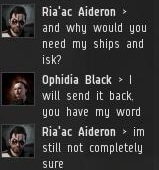 Ria'ac Aideron is in good hands. Give him time, his carebear spirit is slowly changing to accept the new order. See, the new order changes the carebears into a better person, but their carebear spirits are holding them back, that's why we need to crush their spirit, so they can change into a better person. I'm actually starting to respect the NO and am considering (only considering ATM lol) joining them! * makes note to see shrink! I hope this story turns out to be the happy ending promised and that the NO can be trusted. Dude should have just walked away with the losses and lesson learned. 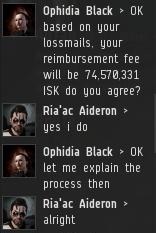 He has a mining permit now and 11m ISK left he could just use his venture and mine his way back, if he wants to continue to be a miner. 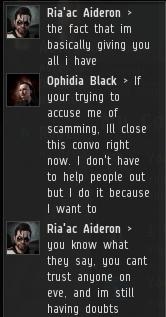 The New Order endorses scam artists like Erotica 1 so it would not be wise to all your stuff to NO personnel.